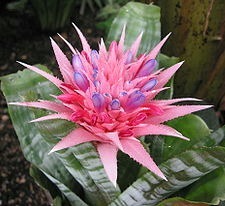 Aechmea fasciata (also known as the Urn Plant or Silver Vase Plant) are one of the most popular bromeliad species. They are commonly kept indoors as houseplants; however, they can be displayed outdoors as long as they are brought inside before the first frost. The dark green arching leaves are banded with silver-white, and have a waxy finish. The smooth finish helps the plant gather water in its reservoir. Individual leaves can grow to 15 in/37.5 cm in length, and bromeliad height can reach 20 in/50 cm. Urn Plants produce beautiful, pink bracts containing blue flowers that persist for 4 to 6 weeks. The blue flowers are short-lived and eventually turn red. Silver Vase bromeliad plants require bright light with some direct sun. When moving this plant outside, take care to the plant to direct sun slowly. This will prevent scorched leaves. In the summer, plants enjoy outdoor conditions (as long as the temperatures range between 70 - 85° F / 21 - 30° C. Bring plant indoors from fall to early spring. Room temperature should average 65 - 75° F / 18 - 24° C.
In the summer, feed monthly with a liquid fertilizer mixed at ½ the normal strength. Spray it on the leaves and fill the reservoir at least 1 in / 2.5 cm deep. Empty the reservoir and fill with fresh water after one week. In winter, fertilize bromeliad every other month. Add water to the reservoir when it dries out – at least every ten days. Do not allow standing water to sit in the reservoir – change it weekly if necessary. Lightly water the roots on a weekly basis in the summer. Aechmea fasciata will require less water in the winter. Keep soil slightly moist - do not allow the roots to dry out completely. Use an orchid potting soil or a bromeliad mix. Add peatmoss to an equal volume of general house plant mix for well draining combination. Divide and repot offsets when they are four to six months old and at least 6 in / 15 cm tall. Repot young plants annually in the spring until they fill an eight inch pot. Silver Vase bromeliads reach full maturity in three to four years. In addition to the mottled green leafed form, ‘Purpurea’ features leaves brushed with maroon. ‘Variegata has creamy stripes on the leaves. Display near plants with lush foliage (such as ferns or flowering plants) and similar lighting requirements. Young offsets can be mounted on a piece of wood for one season.